· Any touchscreen will be able to call any other individual touchscreen and perform two-way communications. A proper scenario would be to use a touchscreen located in one area of the residence, to call a touchscreen in another area of the residence without announcing over all other touchscreens. · Any touchscreen will be able to call a specific group of touchscreens to make an announcement (one-way call). A proper scenario of this would be the homeowner paging everyone in the home to announce that it's dinner time. · When a door station is rung, it will notify a specific group of touchscreens with a preview of the door station's camera feed. If any of the touchscreens answers, it will establish a video call with that door station and stop ringing the other touchscreens. · OmniTouch 7 has to know if a door station is calling it and its make (2N or other door station), in order to display the video preview. · Multiple door stations will be supported. Omni Automation Controller: Omni LTe, Omni IIe, Omni Pro II, Lumina, and Lumina Pro (Note: automation controller must be running firmware version 3.9 or higher). 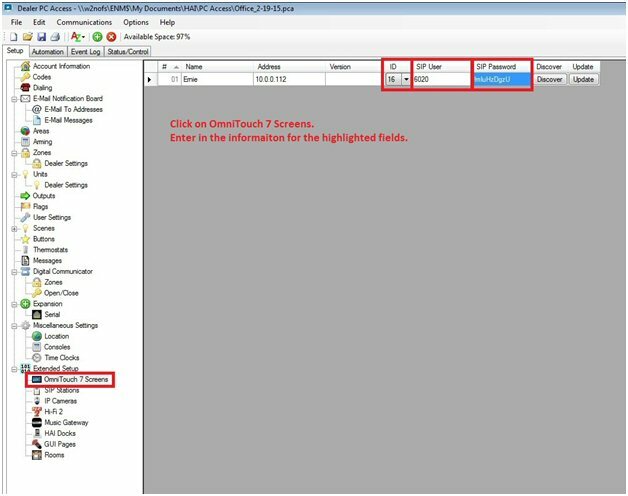 OmniTouch7: touchscreens must be running firmware version 1.14 and Kernel 1.2 or higher. PC Access Software: must be running version 3.15.0.799 or higher. Set up the SIP server on the local network. A static IP address must be used. Create extensions for every touchscreen and door station. Each extension requires a username and password. Any password may be used for each device, but they can all use the same password for simplicity. Be sure that each extension has H.264 video support enabled. Create a ring group extension for all of the touchscreen extensions. This extension will be used by the door station(s). Create a paging group extension for all of the touchscreen extensions. This extension will be used to page all touchscreens from one of the touchscreens. 1. Open the controller’s PC Access file. a. SIP Server Address – enter in the IP Address assigned to the SIP server. b. SIP Server Port – this is the port configured in the SIP Server. c. SIP Page Group – this is the number created in the SIP server to page a group of extensions. a. ID – enter in the desired ID for each touchscreen installed. 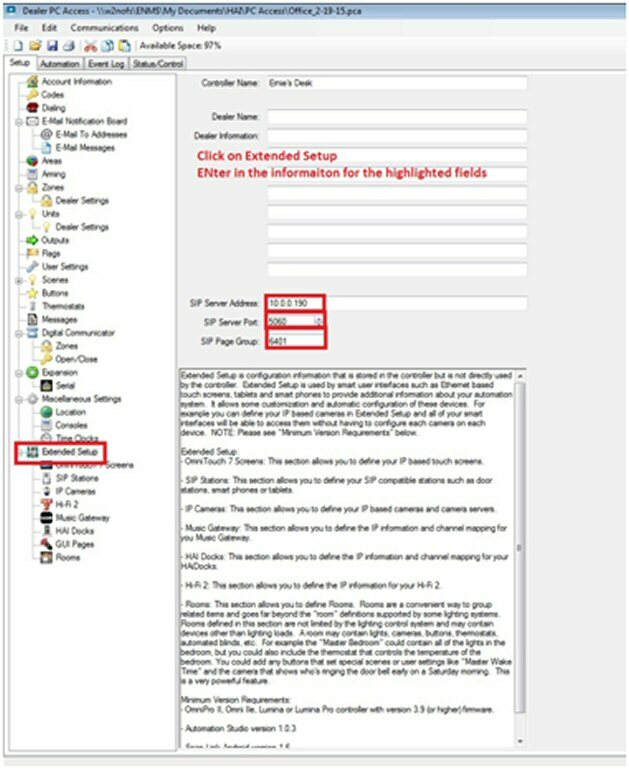 b. SIP Username – enter in the username created for the assigned extension in the SIP server. CRITICAL NOTE: When using a Zycoo SIP Server, this "must" be the extension number and not name of the extension. When using an Epygi SIP Server, you must use the "user name" created for the extension. If using another brand of SIP server, check with the manufacturer as some products are extension specific, whereas others require a user name. c. SIP Password – enter in the password created for the assigned extension in the SIP server. a. To add a SIP Station, click on the green “+” in the icon bar. b. SIP Station Name – this should be a name that will identify itself to the touchscreens. c. Station Type – select the type of device (e.g. Helios 2n). d. Station Address – enter in the station’s IP Address or host name. 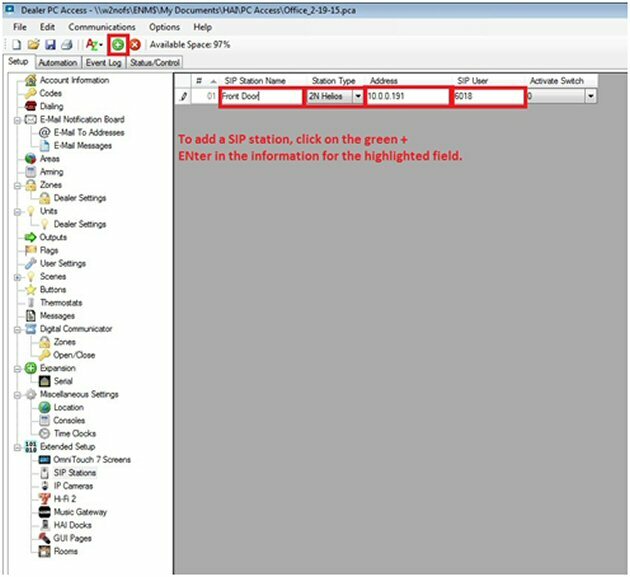 e. SIP Username – enter in the username assigned by the SIP server for the station. 5. Once all of the above fields have been completed, establish a connection to the automation controller and Write the Extended Setup to the controller. 1. At each touchscreen installed, go into the internal Setup Configuration and set the Touchscreen ID to match the value set in the PC Access file. 2. Press the SAVE & EXIT button. 3. After rebooting, test the system.